Also, another day that's left me feeling very odd. It began with a trip to the apartment building on 16th Avenue where I lived from December 1989 until April 1994. And...actually, I think I'm gonna save that part for tomorrow's entry. I need to wind down. So, later. I went with Spooky to Alabama Art Supply, where I'd not been since at least 2002. We had Milo's for dinner. And I haven't mentioned that we've been working our way through the whole of Game of Thrones again, in preparation for Season Eight. Somehow, we've made it to Season Seven in only about two weeks. We power binge. It's kinda scary. 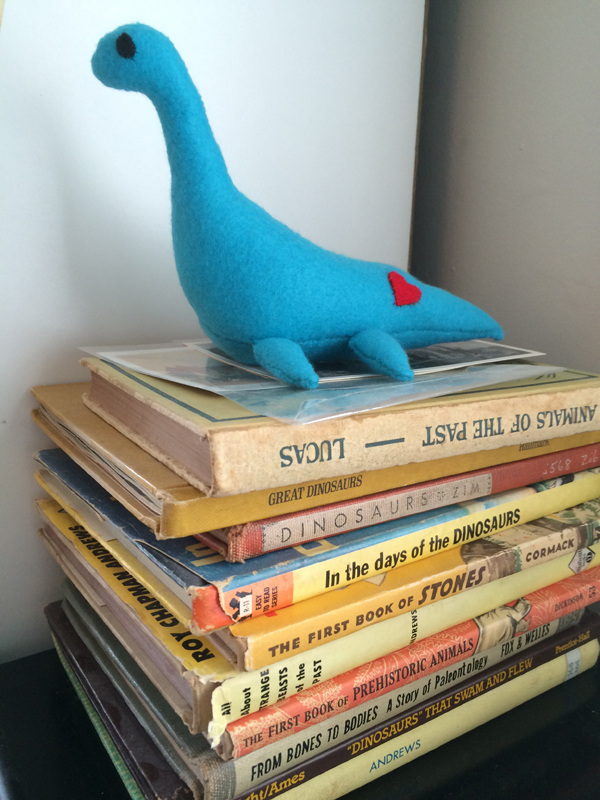 I leave you with a bunch of childhood dinosaur books and the blue felt plesiosaur/Nessie that my mom gave me for Christmas. Current Music:They Might Be Giants, "We Want a Rock"